You will find that there are many benefits to getting a baby walker for your child, so they are definitely worth looking into. A baby walker can help your child stay upright and mobile, allowing them to maneuver around a room without any help. If you want to find the best baby push walker, it is important that you know what your options are like. A lot of parents decide to get their child a walker because they can be both a fun and helpful toy. If you want to keep your baby happy and safe, it is highly recommended that you see what there is to choose from before deciding on one in particular. These walkers come in a wide variety of sizes and designs, making it all the more important for you to explore the options that are available. When your child is just starting to learn how to stand up on their own, a baby walker can be an excellent thing to give them. They will get a sense of independence while having fun at the same time, making it extremely beneficial for the child overall. Many of these walkers have an interactive design that is able to keep the child engaged while helping him or her walk without help. When you take the time to look into some of the better baby push walkers in this post, you will be able to choose the right one for your child. The Sit-to-Stand Learning Walker from VTech offers a number of great features, including a removable play panel. The “early learning center” has 5 piano keys that play music and encourage creativity. The wheels on this walker run smoothly over all surfaces. This baby walker also features 2 colorful spinning rollers, 3 shape sorters, and 3 light-up buttons that help with developing motor skills. There is even a pretend telephone handset and mechanical elements for role play fun. You will get 2 AA batteries with this walker. With over 70 different sing-along songs, music, and sound effects, this baby walker has plenty to offer your child. There are many different baby walkers on the market, but this one in particular offers a lot more than most of them do. One of the best things about the Sit-to-Stand Learning Walker is the fact that it is designed to be fun and engaging for kids. The two modes of play this baby walker offers include learning and play. Overall, this baby walker is highly interactive and a lot of fun for small children, allowing them to walk around independently while playing around with all the engaging interactive buttons. Any child who is 9 months to three years old will definitely have a good time with this walker. Highly interactive design with lots of lights and sounds. 70 different sing-along songs for your child to choose from. Pretend telephone to allow for role play fun. Wheels have brakes to prevent slipping. The sound effects are somewhat loud. The pretend phone tends to slip off easily. The Safety 1st Ready-Set-Walk walker is comes with a total of three toys that are appropriate for multiple developmental activities. Your child will be able to enjoy 12 different songs as well as a flashing light. This walker was designed with a unique base for superior stability. If you are looking for a baby walker that you won’t need to worry about your child falling down while using, this is certainly a good pick. One of the truly great things about this walker is the padded seat, which is machine washable and will be very comfortable for your child. There is also the fact that this baby walker is very easy to clean and wipe down because there are no crevices. The three-position height adjustment feature will make it incredibly easy for you to adjust the walker to your baby’s height. 3 different height adjustment settings for babies of all sizes. Multiple toys to aid with developmental growth. Folding design makes it compact and easy to store and transport. Plastic legs have a somewhat flimsy design. Rear wheels are fixed, making it somewhat difficult to turn corners. The Fisher Price Bright Beginnings Activity Walker is a great overall choice if you want to make your child’s first steps fun and exciting. This walker includes flipping doors, sliding beads, turning gears, and spinning panels. There is a ball in the center of this walker that spins, so you child will stay entertained and engaged while learning how to walk on his or her own. This walker was designed to encourage the development of motor skills, making it both fun and practical. One of the great features of this baby walker is that it folds up so it’s very compact and easy to store wherever or take with you on the go. If you are searching for a walker that offers numerous hands-on activities for your child, this one is certainly worth considering. This walker offers enough toys and gadgets to make walking fun for your child, including the numerous gears and panels that they can spin around. It also has a very colorful design, which only adds to the fun for your baby. All of the different colorful sliding and spinning parts on this walker make for a very fun way for your child to improve his or her developmental skills. This walker is definitely one of the more popular models on the market. Many different colorful parts for your child to play and have fun with. Can be used on just about any type of flooring with ease. Portable design that is perfect for easy storage. Tends to slide around and can make it difficult for some children to use. Wheels sometimes have trouble spinning. The Joovy Spoon Walker features a super-sized tray with a removable insert that that is perfect for placing toys on, and it is dishwasher safe. The seat pad on this walker offers great support and comfort, and it can be cleaned in a dishwasher as well. You’ll find that this walker also has a very compact design, so you shouldn’t have any issues when it comes to storing and transporting it wherever you need to. The three different height positions make this walker perfect for all babies regardless of their size. There are oversized wheels and non-slip stair pads for easy navigation over nearly any type of flooring. This walker is an especially great choice if you are looking for one that your child will be able to use on carpeting or hard surfaces. The best thing about this baby walker is that its design allows for playing, walking, and eating. The extra-large tray is great for placing drinks, toys, and many other things on. There is also the fact that the tray can be easily removed and cleaned without any issues. Versatile design that allows for eating, playing, and walking. Extra-large base that keeps your child safe while offering lots of room for objects. Removable parts are easy to clean. Walker can be difficult to maneuver around corners. Somewhat heavy and can be cumbersome to travel with. The Chomp and Clack Alligator Walker from Melissa & Doug is made entirely of wood, making it incredibly durable and long-lasting. There are three chomping alligators, fish on wheels, spinning butterfly and ladybug beads. This baby walker will make noise as your child pushes it, keeping them stimulated and entertained while learning how to walk. It is an excellent walker for helping your child to walk with confidence and independence, and is well-suited for children 12 months and up. The colorful chomping alligators offer a multisensory experience for your child, making it fun to use while working on important developmental skills. There are also cattails on the handle supports so you don’t need to worry about your child falling down while using this walker. The durable, detailed, handcrafted construction of the Deluxe Chomp and Clack Alligator Activity Walker make it an excellent choice, especially if you want your child to have an easy time learning to walk. The fact that this baby walker is made by Melissa & Doug is yet another reason to consider purchasing it. This company definitely has a reputation for producing top quality children’s toys that also help grow important developmental skills. Extremely sturdy and durable design. Clacking alligators offer visual and auditory stimulation. Easy to maneuver along most surfaces. Can be difficult for children to use the walker on carpeted areas. Paint tends to start chipping off after a while. Buying a baby walker is a great idea for many different reasons, but most of all because doing so will help your child to walk with confidence while having fun. If you want to teach your child how to stand on his or her own in a fun and entertaining way, this is a great option to consider. A baby walker can make learning how to walk a lot easier for a child, so it’s highly recommended that you make a point of looking into getting for yours. Many of these walkers offer colorful designs and toys that will keep your child stimulated while walking. When it comes to helping your child to take his or her first steps and become more confident in their ability to stand on their own, it is important to consider getting one of these walkers to make the entire process easier as well as entertaining. If you are currently looking for a baby walker, the VTech Sit-to-Stand Learning Walker is by far the best one there is on the market. 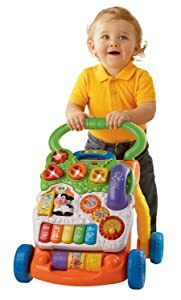 This particular walker offers multiple toys for your child to play with so they can have a lot of fun doing it. One of the things that separate the Sit-to-Stand walker from many of the others on the market is the fact the sheer number of colorful toys it offers. This walker has over 70 different songs, which is certainly more than you will find with most others.